Trauma does not just happen to a few unlucky people; it is the bedrock of our psychology. Death and illness touch us all, but even the everyday sufferings of loneliness and fear are traumatic. 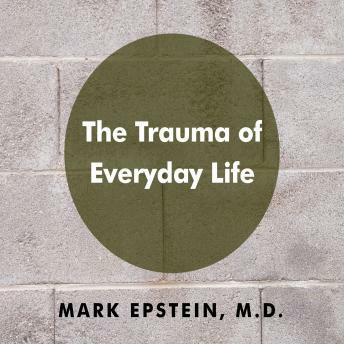 In The Trauma of Everyday Life renowned psychiatrist and author of Thoughts Without a Thinker Mark Epstein uncovers the transformational potential of trauma, revealing how it can be used for the mind's own development. Western psychology teaches that if we understand the cause of trauma, we might move past it while many drawn to Eastern practices see meditation as a means of rising above, or distancing themselves from, their most difficult emotions. Both, Epstein argues, fail to recognize that trauma is an indivisible part of life and can be used as a lever for growth and an ever deeper understanding of change. When we regard trauma with this perspective, understanding that suffering is universal and without logic, our pain connects us to the world on a more fundamental level. The way out of pain is through it. Epstein's discovery begins in his analysis of the life of Buddha, looking to how the death of his mother informed his path and teachings. The Buddha's spiritual journey can be read as an expression of primitive agony grounded in childhood trauma. Yet the Buddha's story is only one of many in The Trauma of Everyday Life. Here, Epstein looks to his own experience, that of his patients, and of the many fellow sojourners and teachers he encounters as a psychiatrist and Buddhist. They are alike only in that they share in trauma, large and small, as all of us do. Epstein finds throughout that trauma, if it doesn't destroy us, wakes us up to both our minds' own capacity and to the suffering of others. It makes us more human, caring, and wise. It can be our greatest teacher, our freedom itself, and it is available to all of us.